I am grateful for this opportunity to participate in this panel on issues related to the measurement of Cuba’s balance of payments position. My colleagues on the panel will elaborate on various problems that arise in interpreting Cuba’s official balance of payments (BOP) statistics. My job today is to provide a conceptual framework for their presentations. To begin, I will offer some thoughts on why the analysis of a country’s balance of payments is important. Everyone here of course is familiar with these issues and so I can be brief. But in thinking about what we can learn from BOP data, it is always crucial to remind ourselves of the potential weaknesses of these data and the care with which policy decisions need to be taken on the basis of these data. 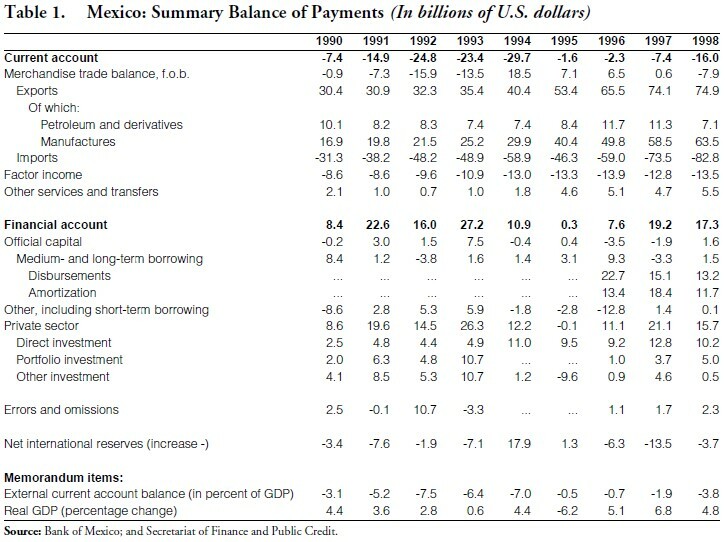 I will next discuss the analytical presentation of balance of payments statistics; and conclude with an example of how macroeconomic imbalances can reveal themselves in a country’s external accounts using Mexico’s BOP data for the periods before and after the 1994/95 crisis as an example. The BOP is a statistical statement designed to provide, for a specific period of time, a systematic record of a country’s transactions with the rest of the world. BOP data are most important for national and international policy formulation. External aspects— such as payments imbalances and inward and outward foreign investment—play a leading role in economic and other policy decisions in the increasingly interdependent world economy. Such data are also used for analytical studies, for example, to determine the causes of payments imbalances and the need to implement adjustment measures; relationships between merchandise trade and direct investment; aspects of international trade in services; external debt problems; income payments and growth; and effects of exchange rate changes on current and capital account flows. Similarly, BOP data constitute an indispensable link in the compilation of data for various components of the national accounts (e.g., production accounts, income accounts, capital accounts, and the related measurement of national wealth). Careful analysis of the balance of payments is particularly important when we suspect that inappropriate economic policies—such as excessive fiscal stimulus, an imprudent monetary stance, an overvalued exchange rate, or rising labor costs unmatched by productivity gains—are leading to rising consumption and an excess of overall savings over investment in the economy. These imbalances between savings and investment can have potentially destabilizing economic and financial effects. If they are short-lived, owing perhaps to reversible policy mistakes or temporary shocks, rather than to decisions made solely on the basis of political expediency, economic entities can endure adverse policy conditions for a time by accumulating indebtedness domestically or with foreign creditors. But if inadequate policies persist and financial confidence erodes, economic growth eventually would slow, inflation and unemployment would rise, and the country’s official holdings of foreign exchange could begin to decline rapidly. Early awareness of symptoms of deterioration in a country’s external payments position and early diagnosis of the cause of the deterioration can make all the difference between having to deal with a full-blown currency crisis requiring economically painful correction, or weathering financial turbulence with more politically manageable policy adjustments. An economy is comprised of resident economic entities (people, corporations, governments) that trade and invest with, or transfer resources—such as grants or gifts— to nonresident economic entities (persons, corporations, governments, who live or operate outside the country’s borders). A basic convention of a BOP statement is the double entry accounting system in which every transaction is represented, ideally, by two entries of equal value. If, for example, an exporter receives foreign currency in payment for goods, a credit entry would be recorded in the BOP accounts for the export of goods and an offsetting debit entry would be recorded for the exporter’s increase in foreign currency bank balances (or other forms of foreign currency assets). The BOP accounting system requires that both entries for a transaction be recorded at uniform values and in the same time period. To satisfy this requirement, transactions are recorded at market value, and the time of recording is typically the point at which a change of ownership occurs. In practice, it is difficult to achieve these theoretical ideals. Different data sources are often used to measure the two entries in a transaction, and these data sources may not reflect uniform valuations and times of recording. In addition, coverage of transactions by data sources often is incomplete, a factor that results in omissions in the BOP accounts. Income on external financial assets and liabilities is recorded on an accrued (earned) basis. This concept, which is broader than the actual payment of dividend and interest, covers dividends due for payment, interest accrued, and unremitted profits of direct investment enterprises. Again, what is theoretically desirable may not feasible in practice, and the BOP compiler may need to work with cash data for some transactions and accrual data for others, which again will give rise to discrepancies in the BOP statement. Another source of difficulty in compiling BOP data is the exchange rate used to convert transactions and stock positions denoted in one currency to the currency, or unit of account (usually the US dollar), in which the BOP accounts are compiled. Ideally, this conversion is made at the midpoint exchange rate applicable to the transaction and at the midpoint rate applicable on the date on which the stock position is measured, but in practice this may not always be possible. Another difficulty is that controls also have been relied on by countries to slow inward capital movements when these are believed to have undesired effects on the conduct of monetary policy, or to stop capital flight when governments feel unable to deal with these outflows with policies that would restore macroeconomic equilibrium. With rare exceptions, these restrictions can be easily circumvented through all sorts of devices, such as under invoicing of exports, over invoicing of imports, parallel markets, and outright bribes, to name a few. Needless to say, recourse to these devices hampers the ability of data compilers to produce accurate and consistent statistics. And without good data it is difficult for policy makers to make an informed judgement on the effectiveness of a particular macroeconomic stance. At the same time, it is not too difficult to see that, with or without good data, the imposition of restrictions on trade and exchange transactions detracts from the making of sound investment decisions and drives entrepreneurial activity towards the pursuit of rentseeking activities, with predictably negative consequences on economic efficiency and performance. In sum, incomplete or overlapping coverage, nonuniform prices, inconsistent times of recording, inconsistent conversion practices, and trade and exchange restrictions that create incentives to conduct transactions through informal channels, all can lead to distortions and inconsistencies in BOP statistics and result in sometime large errors and omissions in the BOP statement. The foregoing suggests that BOP statistics, or statistics in general, should not be taken at face value, and that the time spent uncovering and analyzing data weaknesses is well worth the effort. These potential data collection problems should not discourage us from looking at BOP numbers, albeit with a proper degree of caution. As we shall see below in discussing the Mexican currency crisis of 1994/95, incipient imbalances may well manifest themselves in the external accounts well before a fullblown crisis hits. This was the case with the December 1994 peso devaluation. In fact, early warnings of impending BOP pressures were also visible in the late 1990s in Argentina, Brazil, South Korea, Indonesia, Thailand and, for that matter, in the continuing external imbalances in the United States and Japan. For all of its statistical shortcomings, a BOP statement is a key macro prudential indicator: it can send an early signal that problems are brewing well before these become serious. Moreover, data deficiencies in BOP statements of individual countries tend to persist over time and tend to be of the same kind and, therefore, in analyzing BOP accounts these deficiencies would not necessarily conceal the emergence of an external imbalance. 3. changes in the net reserve assets of the monetary authorities (which in the Fund’s BOP Manual are included in the financial accounts). Each of these components are discussed briefly below. The Current Account: The current account covers all transactions (other than those registered as financial items) that involve economic values and occur between resident and nonresident entities, or that are provided or acquired without a quid pro quo. Specifically, the major classifications are goods, services, income, and current transfers. Goods trade involves mainly merchandise that is exported to, or imported from, nonresidents by residents and that, with a few exceptions, undergo changes in ownership. Other types of transactions classified under goods include goods crossing the frontier for processing abroad and subsequent reimport; repair activity on goods provided to or received from nonresidents on ships, aircraft, etc. ; goods procured in ports by nonresident carriers, such as fuel, provisions, and supplies; and nonmonetary gold, which, when not used as a means of payment, is treated the same way as any other commodity. Services comprise mainly transportation, travel, provision of insurance, fees and commissions for financial services, royalties and license fees, and government services such as expenditures of embassies and consulates. Income includes compensation of employees which is paid to nonresident workers (e.g., border, seasonal, and other short-term workers), and investment income receipts and payments on external financial assets and liabilities. Included in the latter are receipts and payments on direct investment, portfolio and other investments, and receipts on reserve assets. Current transfers consist of two major categories: transfers between governments or private parties in the form of grants or gifts whether in cash or in kind; and workers’ remittances, which can be quite a large item in the BOP of countries with significant numbers of its citizens working abroad and considered residents there. India, China, Turkey, some of the countries of the former Soviet Union, and Mexico and Haiti in the Western Hemisphere are examples of countries benefiting from large inflows of remittances For many developing countries, particularly the poorest ones in Africa, current transfers in the form of foreign aid is one of the most significant components of their external accounts. The Capital and Financial Accounts: The capital and financial accounts cover all transactions that involve the receipt or payment of transfers and acquisition or disposal of nonproduced, nonfinancial assets (capital account); and all transactions associated with changes of ownership in the foreign financial assets and liabilities of an economy (financial account). In the capital account, a capital transfer, as distinguished from a current transfer, is one that should result in a commensurate change in the stocks of assets of one or both parties to the transaction. A current transfer, on the other hand, reduces the income and consumption possibilities of the donor and does the opposite to the recipient. Debt forgiveness is an example of a capital transfer; transactions associated with assets that may be used for production of goods and services but have not themselves been produced, such as patents, copyrights, trademarks, franchises, etc., are also considered capital account items. The functional classification of the financial account comprises three main categories of investment: direct investment, portfolio investment, and other investment. Depending on the type of analysis for which BOP data are being utilized, it is sometimes helpful to make a distinction between public and private movements of capital. In those cases, the capital and financial accounts are presented on the basis of four major categories: direct investment; official capital (which would include all governmental activity with nonresidents, with placements of sovereign debt shown as the principal item); private capital, both short and medium-term; and errors and omissions. Direct investment is used to register a transaction when an individual investor seeks a significant voice in the management of an enterprise operating outside his or her resident economy by providing a substantial amount of the equity capital of the enterprise, and/or by supplying additional capital for expansion. Over the last decade, direct investment has become a major component of the balance of payments of those countries which have undergone significant structural change. To the extent that these so-called emerging market economies have reduced their government’s financing needs, updated their budget practices and tax systems, redeployed assets to the private sector, opened their economies to competition, and reformed their product and labor markets, they have benefited immensely from the advantages of the global economy, becoming recipients of large inflows of foreign direct investment. Portfolio investment consists of cross-border investment in equity and debt securities (other than direct investment). In the current fifth edition of the IMF’s Balance of Payments Manual, the formal distinction between long-term and short-term investment is not made for portfolio investment because it was thought that formal maturity is not likely to be a significant factor affecting the behavior of the components of the category. However, in the aftermath of the last Mexican devaluation, and more recently after the Asian Crisis and the Russian debt default, there has been a call for the IMF and the World Bank to work together to develop a set of guidelines on public debt management to assist countries in their efforts to reduce financial vulnerability. This work is now well under way. In addition, in response to large-scale changes occurring in recent decades in the size and nature of financial derivative markets, a number of modifications have been introduced in the Fund’s BOP Manual. An important change was the recognition of interest rate swaps and forward rate agreements as financial assets and the recording of net cash settlements resulting from these contracts as financial transactions rather than investment income flows. In this connection, a new functional category, “financial derivatives,” has been created for the BOP. Other investment is a residual group which comprise many different kinds of investment, including trade credits, loans, currency and deposits. For purposes of this paper, I will follow the presentation in the IMF’s Balance of Payments Manual, with one exception. As noted earlier, the Manual classifies the net official reserves of the monetary authorities as a component of the capital and financial account. In the rest of this text and in the tables, changes in the net official reserves (assets minus liabilities) are treated as a separate line in the BOP statement. This separate line is often referred to by many in the trade as the bottom line of the BOP statement, because it provides one of the clearest indications, together with price data, of imbalances in the economy, and is the trigger for changes in the external value of a country’s currency when the imbalances become acute. Finally, in BOP statements, the standard practice is to show separately an item for net errors and omissions. Labeled by some compilers as a balancing item or statistical discrepancy, that item is intended as an offset to the overstatements or understatements of the recorded components. Some of the errors and omissions that occur in the course of compilation usually offset one another. Therefore, the size of the residual item does not necessarily provide any indication of the overall accuracy of the statement. However, large and variable residual items can be indicative, for example, of capital flight in the face of an impending devaluation, or of unrecorded outflows to bypass exchange controls. Positive net errors and omissions can be indicative of proceeds from illicit activities. Changes in the Net Reserve Assets of the Monetary Authorities: Examining movements in the net reserve position of the monetary authorities is an essential element in the analysis of an economy’s external position. Reserve assets consist of those external assets that are readily available to and controlled by monetary authorities, usually central banks, for direct financing of payments imbalances, for directly regulating the magnitude of such imbalances through intervention in exchange markets to affect the currency exchange rate, and for creating confidence in the strength of the economy and its currency. Timeliness in reporting reserve data is an issue that also needs to be considered. Accurate data that are reported only with several weeks’ lag can be of little help in establishing or restoring financial confidence. Also, some central banks rely on the dubious practice of using short-term nondeliverable forward contracts (NDFs) with commercial banks, as opposed to buying/ selling spot, to conduct foreign exchange intervention. Moreover, whereas central bank reserves are usually reported with a one- to four-week lag, NDFs often are published with as much as a four-month lag to avoid disclosing the scale and maturity profile of NDF-based operations to market participants. It is, of course, not expected that central banks disclose the extent of their involvement in the exchange market while it is in progress. However, NDFs and other similar operations and the lags in reporting them create a misleading picture of the central bank’s reserve position and intervention policy. One of the principal lessons of the Asian crisis is the importance of central bank transparency, and central banks that traditionally have chosen to conduct their operations in great secrecy are slowly coming around to understanding that full integration with world financial markets demands much greater transparency than in the past. An integrated system of accounts covering national income and expenditure, as well as financial flows and associated stocks, lies at the heart of the macroeconomic appraisal and analysis of the economic performance of any economy. For each sector of the economy, the transactions between its members can be divided into two categories: transactions arising in the course of producing or acquiring goods, and financial transactions. Imbalances in these activities are reflected in the domestic price level and in the country’s external position. In open economies, excess demand pressures spill over quickly into the balance of payments. In these circumstances, a gap would emerge between national savings and investment that would need to be financed with external savings. In the BOP this “domestic resource gap” would give rise to, and be the mirror image of, a current account deficit, which in turn would need to be financed through a combinations of capital inflows—public or private—and/ or a drawdown of the net international reserves of the central bank. If external savings are not available because the country’s creditworthiness has eroded, its official reserves have been depleted, or because contagion effects have denied it access to international capital markets, the adjustment to these new circumstances would occur almost instantaneously. In the external sector, trade credits and other types of financing would dry up, imports would contract, and the external current account deficit would narrow or disappear, or might even turn into a surplus, depending on the extent of the downturn in domestic activity and on any exchange rate action that might be taken to deal with the situation. On the domestic side, consumption would slow faster than capital formation, and the savings/investment gap would narrow. Less open economies also can be engulfed very quickly in full-blown BOP crises, even if uncertainties regarding economic management, or political turmoil do not spillover immediately into the current account but instead produce capital flight. Strangely enough, when facing a run on the currency, central banks often bet the wrong way by choosing to defend the exchange rate, experiencing in the process a punishing loss of international reserves. Although a major BOP event can unfold very rapidly, it is often years in the making. Many countries have been large net borrowers from the rest of the world for prolonged periods without adverse economic effects. Chile, for instance, had been posting current account deficits of the order of 5.5-6.0 percent of GDP for almost the entire decade of the 1990s, while GDP was growing at a rapid rate with declining inflation. The country’s pursuit of sound policies, including budget surpluses, a cautious monetary stance, and trade liberalization, privatization, and other structural changes had not been lost on investors, who happily more than covered current account deficits with direct investment. In analyzing the BOP, therefore, and, in particular, the sustainability of any specific current account situation, it is important to consider the determinants of financial flows. These flows, as in the case of Chile, might be directly related to increased private capital formation in the form of direct investment, bank loans, or bonds issued in capital markets. While private financing flows tend to provide greater assurance of the sustainability of a given current account deficit than government borrowing, it is not a foregone conclusion that this is always the case. There can be circumstances in which inward movements of private capital can be quite disruptive, if they flow into the domestic banking system attracted by favorable interest rate spreads at the short-end, and if banks, when placing these loanable funds, do not appropriately weigh risk, or are poorly regulated and supervised. This was the situation in Mexico in the period leading to the late-1994 peso devaluation, and it was also at the core of the Asian economic and financial upheaval in 1997-98. Turning to the events that led to the Mexican crisis, and how these could be discerned in the country’s external accounts, the process of macroeconomic stabilization and structural transformation in Mexico that began in the wake of the 1982 debt crisis accelerated during 1988-93. The authorities’ strategy was aimed at attaining external viability and laying the foundation for private sector-led growth. It was based on the following elements: the maintenance of tight financial policies; the use of the exchange rate as a nominal anchor; a comprehensive program of structural reforms; and a major restructuring of the external debt. These stabilization and reform policies produced remarkable results, and private capital inflows surged to an average of over 6 percent of GDP in 1990-93. Mexico therefore entered 1994 with a strengthened economy. But weaknesses remained—and they contained the seeds of the crisis that broke at the end of the year. In particular, the external current account deficit, running at 6.5 percent of GDP a year in 1993, was very large by most standards. It had deteriorated gradually from a position of rough balance in 1987-88; and although reflecting to some extent a rise in investment that could be expected to boost future output and net exports, the deterioration was nevertheless driven by a rapid growth in domestic consumer spending. Thus, between 1987-88 and 1993, private saving had fallen by as much as 7.5 percent of GDP. Also, associated with the widening of the current account deficit was a substantial real effective appreciation of the peso. The sustainability of external current account deficits of this magnitude mainly to finance domestic consumption was clearly questionable, and was highly vulnerable to a sudden reversal of capital flows. Then in January 1994 there was an uprising in Chiapas; this was followed by the assassination of presidential candidate Colosio in late March; another political assassination in September; and a second Chiapas uprising in December. There were also significant shortcomings in Mexico’s policy response. Facing significant outflows, the monetary impact of official reserve loss was sterilized, leaving interest rates virtually unchanged for most of the year; there was an attempt to maintain the peg through the issuance of short-term instruments indexed to the U.S. dollar (Tesobonos); even more damaging, political considerations led to rapid credit expansion by the government- owned development banks to the private sector; and finally, the peso was allowed to float freely in late December but only after Bank of Mexico had exhausted its international reserves. Tables 1 and 2 show the rising trend in the current account deficit through the early 1990s, peaking at 7 percent of GDP in 1994, and the sharp drop in 1995 to close to equilibrium, in the wake of the devaluation. Most of the current account deficit in 1994 was financed with a loss of reserves and proceeds from privatization. In 1995, output contracted by more than 6 percent and inflation soared to 50 percent. In contrast with the 1982 debt crisis, when it took several years before output recovered on a sustained basis, the economy showed much greater resilience and flexibility in both the product and labor markets, with the result that a strong supply response to the exchange rate depreciation was clearly in evidence by the last quarter of 1995. Real GDP growth averaged 6 percent a year in 1996-97. Mexico also has coped well with the contagion effect of the Asian crisis. The external current account deficit has stabilized at about 3 percent of GDP in the last four years, with foreign direct investment covering three-quarters of the deficit. Inflation is down to less than 10 percent a year, and output is expanding by some 4-5 percent in each of the last two years. To conclude, in signaling incipient imbalances and later providing an analytical framework to aid policy makers, the BOP statement is among the most reliable statistical tools available. Because compilers depend on various sources to arrive at the BOP statement, the accuracy of the BOP account depends on the effort that is made to reduce discrepancies and inconsistencies and, in using BOP data, analysts need to be aware of its potential weaknesses. 1. For full details of the standard components of a BOP statement, please consult the Fifth Edition of the IMF Balance of Payments Manual, Table 7.